You can imagine that Barnes & Noble, with 774 stores scattered across suburban strip-mall America, finally got fed up with the way Amazon’s Kindle dominates the e-book market. “I know,” some B&N exec must have said. “Let’s pull an Apple move on their sorry asses!” The result: a nearly buttonless e-book reader that has a color LCD touchscreen where the Kindle has a broad, ugly QWERTY. The Barnes & Noble Nook is, in fact, a handsome device, close to the Kindle in size but with far cleaner lines and a less cluttered look. But that’s where the Nook’s radical innovation ends. For the most part, the rest of the device is a Kindle clone with a few minor, but thoughtful, improvements. The Nook is slightly shorter and narrower than the Amazon Kindle 2, although it’s thicker. Both e-book readers use the same E Ink technology for their main screen: a pale gray, matte surface that looks a bit like an Etch A Sketch but displays text (and monochrome images, with 16 levels of gray) in far more readable fashion than an LCD, thanks to its paperlike opacity. Instead of staring into the glowing eye of a LCD screen, you’re reading light reflected off the surface of the screen, just as you do with paper, and that’s much more comfortable. E Ink also uses less power, so battery life is long (about a week of ordinary use, B&N claims). Both the Kindle and the Nook have small, 6-inch, 600 x 800-pixel screens — only a little bigger than a 3×5 index card — but they seem bigger, thanks to the crispness of the text. 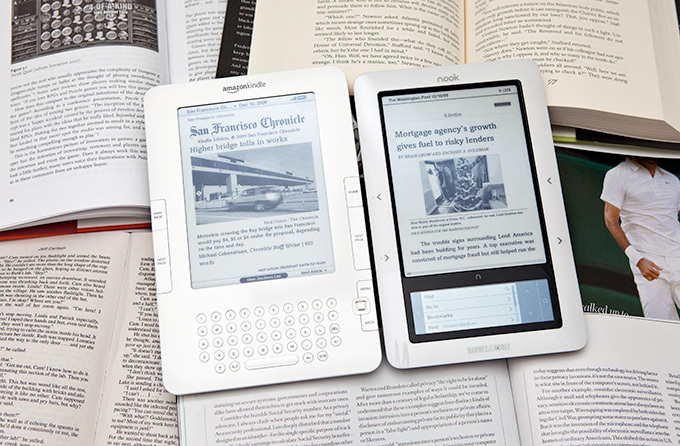 The Nook’s secondary LCD screen adds a splash of color to the reader’s face. This little screen (just 3.5 x 1 inches, with 480 x 144 pixels) displays the Nook’s menus and controls, and it’s where a virtual keyboard pops up whenever you need to type (when searching for a book). It’s not multitouch, but you won’t miss that feature on such a small screen: It’s all about tapping on virtual buttons or swiping menus back and forth. Like the Kindle, the Nook lets you browse, purchase and download books via AT&T’s 3G wireless network. Most books cost about $10, or less than half what they’d cost as new hardcovers — but twice what they’d cost as used paperbacks. The Nook also has Wi-Fi support, although it’s perplexingly limited to B&N’s in-store networks, where you can use it to download books as well as special, location-specific offers (like free cookies). There’s a built-in MP3 player and a headphone jack, which works for playing music while you read, or for playing audiobooks. You can load the Nook with e-books, PDF files, images and MP3 files via a USB connection simply by dragging and dropping, just as you can with the Kindle. The Nook has some nice touches that the Kindle lacks. When shopping for books or browsing your library, you can swipe through color representations of their covers on the lower screen. While reading, the display lets you pick between 5 font sizes and two or three different font faces, depending on the title — so if you really like reading text in Helvetica Neue, go for it. And the Nook supports e-book lending for some titles, depending on the publishers’ preferences. If lending is enabled for a title, you can send to a friend, who can then download and read it on their Nook (or, soon, on Nook applications for the PC and iPhone). While they’ve borrowed the book, you can’t read it, but it automatically returns to your library after 14 days. Some people have also reported success getting the Nook to work with library e-books and audiobooks, via software called Overdrive. Unfortunately, the Nook is marred by a frustrating interface and persistent slowness. Switching between the lower and upper screens is sometimes confusing, and the lower screen’s “back” button sometimes takes you all the way back to the top menu, clearing out whatever was on the upper screen. Occasionally the lower screen takes a few seconds to respond to a tap, so you impatiently tap again, accidentally triggering something you didn’t expect. The upper, E Ink screen is slightly slower to refresh than the Kindle’s — it takes about a second, instead of about half a second — which means these kinds of interface glitches quickly get very frustrating. It seems reasonable to expect that the Nook’s software engineers will iron out these glitches in the next few months, and they’ve promised to deliver software updates wirelessly, with the first, minor update rolling out next week. When they finally get the kinks worked out, the Nook will be an elegant, customizable, competitive alternative to Amazon’s Kindle. Until then, it’s a slightly awkward runner-up. WIRED Attractive, well-designed hardware. Color LCD makes menus and covers look pretty. Ability to switch fonts is a welcome change. Book-lending works with friends and with libraries. Easy reading experience. Expandable via MicroSD slot. User-replaceable battery. TIRED E Ink screen is noticeably more sluggish than the Kindle’s. Occasionally poky interface on the touchscreen. Annoying interface glitches keep tripping up the browsing experience. $260 plus $10 per book might be cheap if you’re used to buying dozens of hardcovers a year — but it’s expensive for those accustomed to buying used paperbacks or visiting the library.